If you haven't noticed, The Time Bum loves independent watchmakers, particularly those tiny start ups that have taken a watch nerd's singular vision and made it real. Granted, they are a mixed bag, but the good ones will turn out a quality piece, with unique character, at a Bum-friendly price. 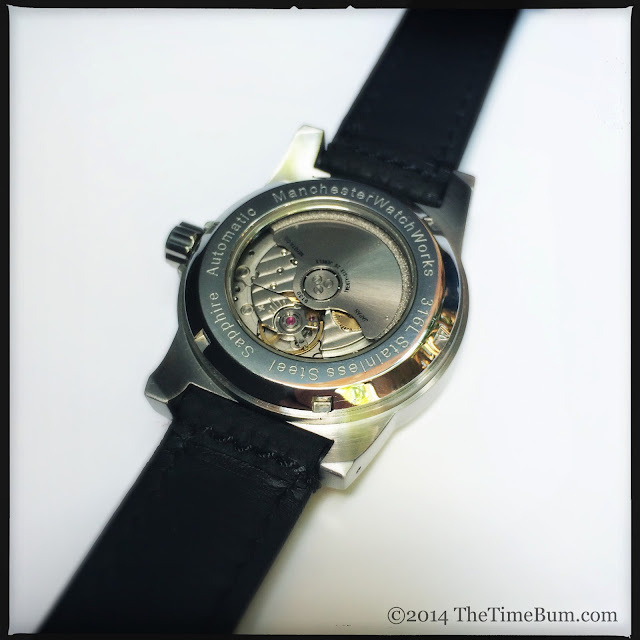 The latest aspirant to cross my path is Douglas Kim of Manchester Watch Works. He just launched the Flagship Limited Edition on Kickstarter with a starting price of $290, and was good enough to share a prototype with The Time Bum for review. Douglas is, first and foremost, a watch enthusiast. Even as kid, he had a watch collection. Through the years, he has owned over 200 watches, and learned how to repair, modify, and build them. No longer satisfied by tinkering with off the shelf components, he set out to design his own. An automatic tool watch was a given. 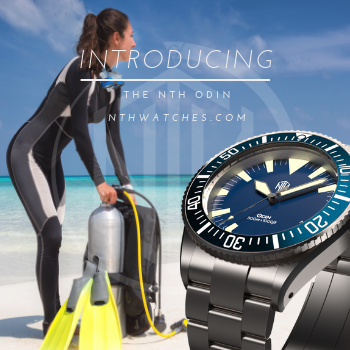 "My watch fascination is not just for fashion, but for the remarkable engineering marvel of a machine that can keep accurate time without batteries but with springs and gears," he explains, "and they can go with you under water, into space, up mountains, and into jungles but, best of all, they can be worn on your wrist." Guided by this vision, he established Manchester Watch Works, named for his hometown in Vermont. 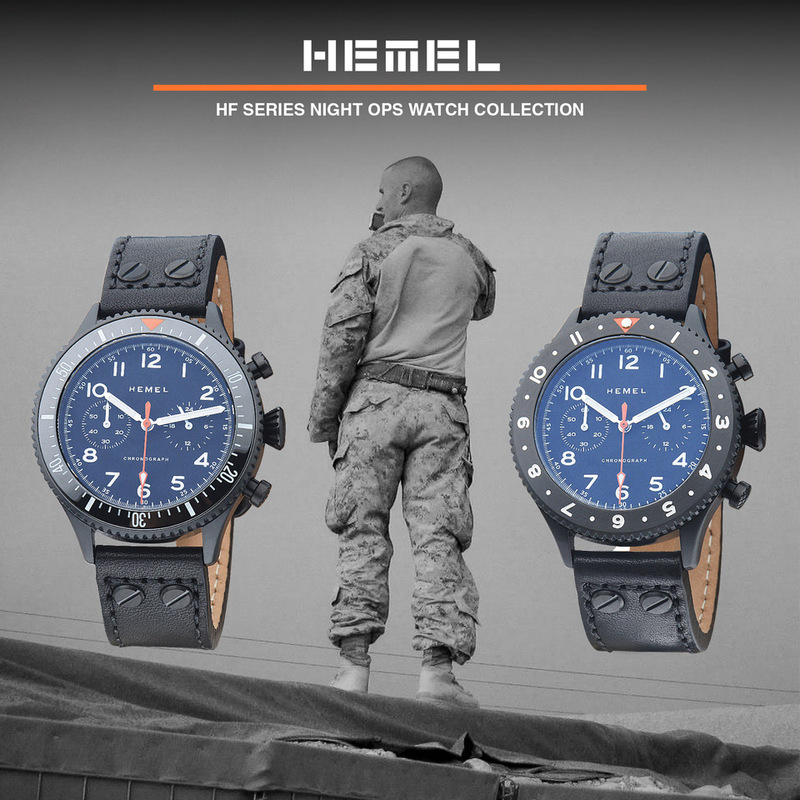 The Flagship is intended to be an all occasion, everyday watch, a mission demanding both ruggedness and simplicity. The first step in achieving this objective is the size. Bucking the trend toward ever larger watches, the Flagship measures a sensible 40mm diameter, 48mm lug-to-lug, and 13mm thick. 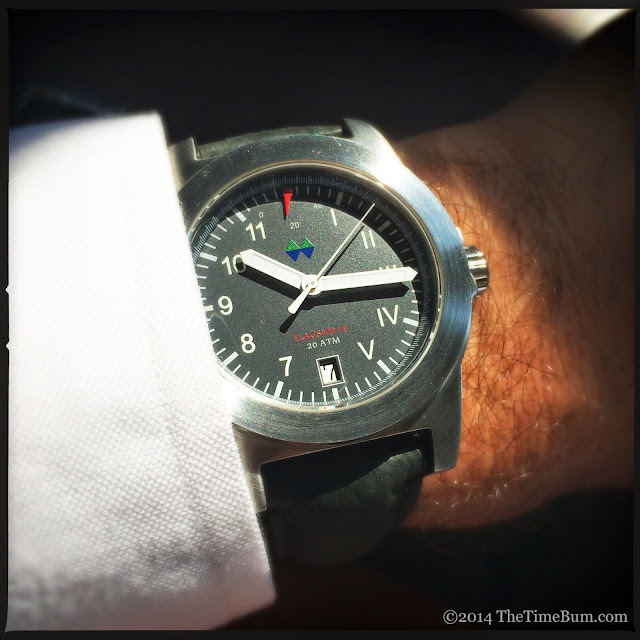 Small wristed watchonistas will rejoice, but the modest footprint does not mean it lacks presence. 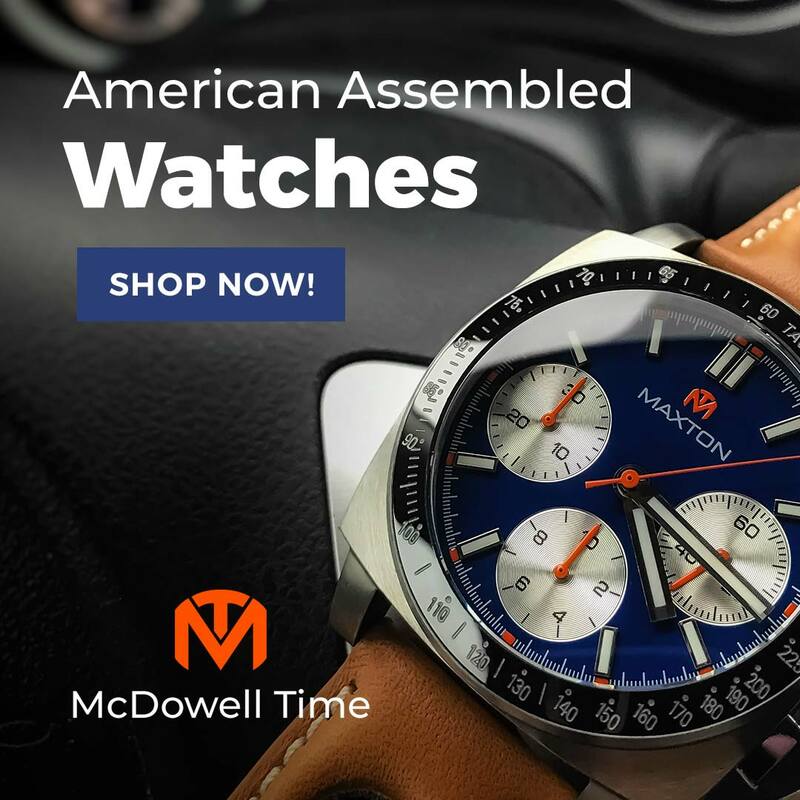 The stainless steel case is round with thick, angular lugs, and flat sides, topped off with broad, flat bezel I that sits nearly flush with the sapphire crystal. The top surfaces of both case and bezel are brushed in a circular pattern. This square shouldered geometry creates a solid, businesslike appearance that is underscored when you pick it up and appreciate its heft. If someone handed me the empty case and told me it was a part from a Pratt & Whitney jet engine, I might believe them. The tough exterior is more than superficial. Its screw down crown and case back, and 200m water resistance give it legitimate tool watch credibility. You notice more detail when the watch is viewed in profile. The lugs curve downwards and are drilled for easy strap changes. Below the lugs, the case steps inward to meet the polished case back, and the polished sides of the bezel become visible, along with a tight channel that separates the bezel from case. The case sides are brushed straight across, lug-to-lug. These join lines and alternating finishes are welcome details on what might have otherwise been a flat expanse of steel. A stout, gear-toothed crown is slightly recessed into the 3 o'clock position, and at this angle, you can appreciate the way its polished finish coordinates with that of the bezel's vertical surface. This is only aspect of the case that I might have changed. The polished finish of crown is immediately apparent when viewing the watch, but the bezel requires a closer look. As a result, I initially found myself staring at the large crown, wondering why it was the only shiny part, before I noticed the polish on the bezel. If the bezel had a polished, beveled edge, the bright surface would have been more visible and the connection between crown and bezel would have been clearer. The polished and engraved screw-down case back features a display window, offering a glimpse of the Miyota 9130 automatic movement within. It is finished, but undecorated, which fits the watch's pragmatic spirit. Like its sibling, the tremendously popular calibre 9015, it has a high beat rate of 28,800 bph, and both hacking and hand winding capabilities. It also has a power reserve indicator at 12 o'clock - an uncommon feature at this price point. Believe it or not, this was my first experience with this function, and I loved it. It was terribly cool to see the needle climb as the watch was wound, and useful to check after the watch had been off my wrist for a day. 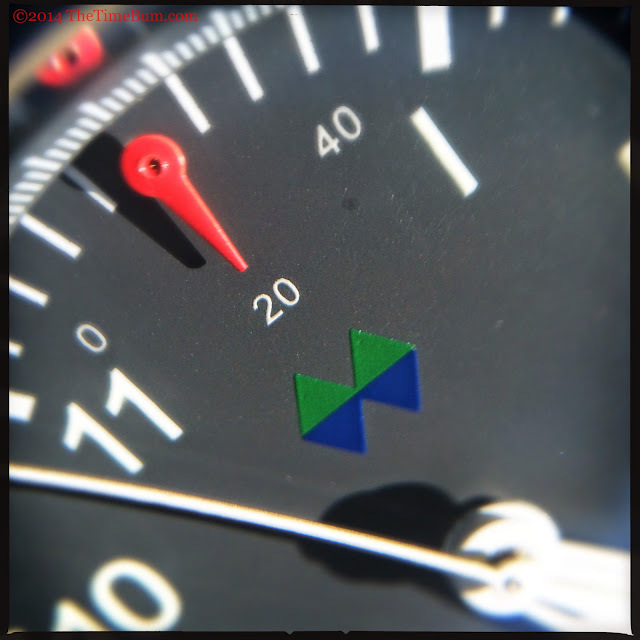 The dial is simple and straightforward but with several interesting elements. It is charcoal grey with white Swiss SuperLuminova markers, and white printed minute markers and an angled chapter ring. My prototype had the "Vermont" dial, a spin on the famous Roman/Arabic California dial, but with the Roman numerals on the right half instead of the top. I admit that I was skeptical at first, but it works, giving the watch a face that stands apart without shouting for attention. The 12 o'clock power indicator is another eye-catching detail. The slim red needle pivots from top center, a place most other watches reserve for a large central marker. Tiny numerals mark 40, 20, and 0 hours remaining. The company logo is printed below the gauge. It consists of four triangles. The green triangles on top make the letter “M” for Manchester and symbolize the Green Mountains of Vermont. The bottom two blue triangles make the letter “W” and symbolize the mountain's reflection on a lake. I think this is brilliant. It is a simple and balanced design where every aspect is significant. I also appreciate the fact that it is the only branding on the dial. Many watch makers go crazy in this area, cluttering the dial with every letter of a long company name, or plastering an oversize logo into the available space, or both. They could take a lesson in logo design and placement from Douglas. The only text is the model name in red, and water resistance in white, just above the black-on-white date window at 6 o'clock. Normally, a white date on a dark dial bothers me, but not so here, likely because of its central location and framed window. The minute and hour hands are thick white pencil shape. 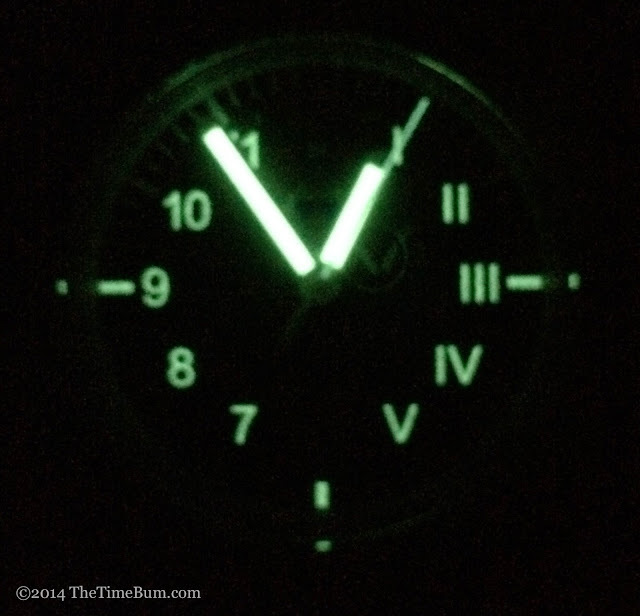 All three hands are treated with lume. While I like the face, I cannot help but second-guess a bit. After all, as an armchair critic who has created nothing and has no background in design, why not? I like the fact that the dial is dark grey and not the more common black, but the blue and green in that perfect little gem of a logo gets lost against the charcoal background and the red model name all but disappears. A black dial would have made the colors of the logo and text appear brighter, increasing contrast and creating a more satisfying pop of color. Manchester offers a more conservative Arabic dial with a white logo, but it seems a shame to eliminate the colors. My other criticism is the shape of the hands. To my eye, they are too heavy. I think a thinner shape with a more pronounced point, such as a losangé pilot style, would have better complemented the fine lines of the indices and numerals. 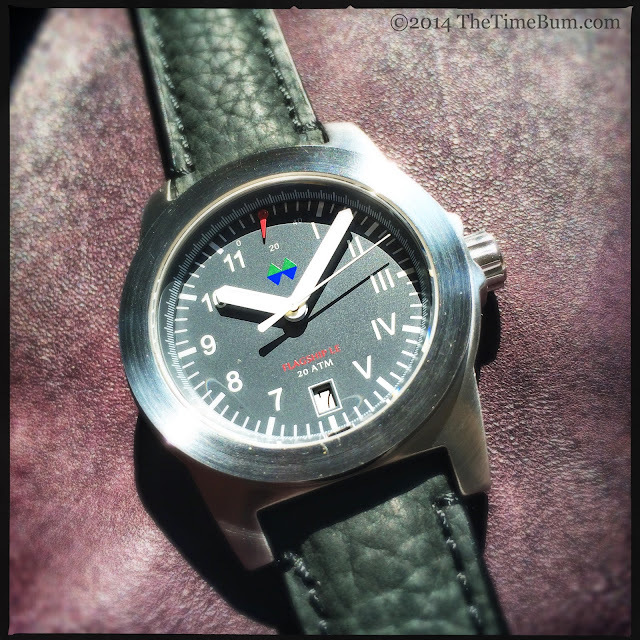 There are three band options: nylon NATO, two-piece leather strap, or brushed stainless steel solid link bracelet. 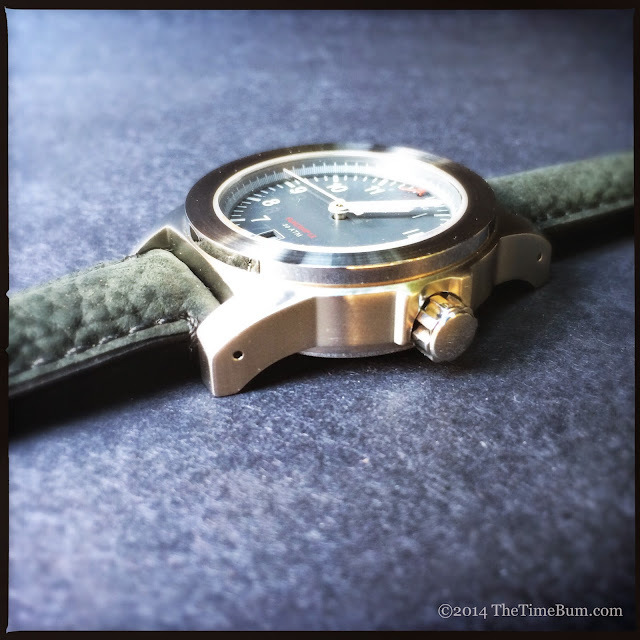 The prototype arrived on a matte black leather strap with embossed buffalo grain and matching stitching. It is of very high quality, lightly padded, and tapers to a 20mm buckle. The muted black works well with the dial, much better than a dark or glossy black. I did not sample the bracelet, but it will have solid end links and an engraved, flip lock diver's clasp. Early bird backers can get a Flagship LE for as low as $290 on a green/blue regimental stripe NATO, $320 on leather, or $360 on a bracelet. It looks great on any of these options but the bracelet offers the greatest value. I found the Flagship to be a perfect fit for my 6.5" wrists, but as mentioned above, this watch is no shrinking violet and would not be out of place on a larger fellow than myself. At 13mm thick, it fit easily under my shirt cuff, which greatly increases its utility. Doug describes it as "a modern military field watch" that is meant to be worn with everything "from no shirt to a tuxedo." 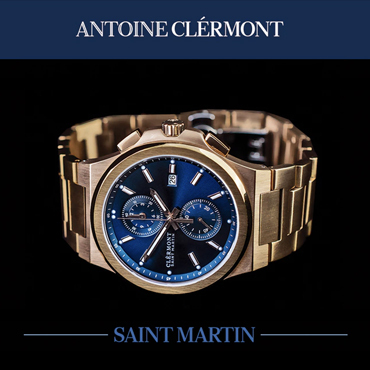 He nailed the first goal, but is it really a watch for any and all occasions? No. I don't believe there is such a thing, and the Flagship is far too much of a tool watch to wear with a suit, let alone formal attire (A tool watch with black tie? For shame, sir! For shame!). That said, its understated good looks and rugged build will carry it though a variety of situations, from outdoor activities in jeans and a tee shirt, to chinos and a button down for a weekend date, to a blazer and tie at the office; however, if you are reaching for your good navy suit to meet with that important client or a attend a wedding, you should put the Flagship back in the drawer and choose a proper dress watch. The watch I evaluated was a prototype, so I cannot scrutinize it in the same manner as a production model, but I got a good feel for what the Flagship is all about. Preproduction changes will include inner anti-reflective coating on the crystal, signed crown and buckle/clasp, case back engraving in the same font as the dial text, and the lug holes will be moved farther from the case to improve strap clearance. If the Flagship has caught your eye, I would recommend grabbing one now. The funding campaign seeks $29,000, which is an ambitious goal, but one I suspect will be met. * After the preorders are filled, the remaining will be sold for the full retail price: $629 for the leather strap version, and $669 for the bracelet. Once they are gone, the watch will be retired. When my time with the Flagship was over, I was sorry to see it go. There is a lot to like in this watch. Fit and finish are excellent; the specs are spot on, and the sober yet idiosyncratic dial exudes a quiet charm. Best of all, it has tool watch wrist presence in a sensibly sized case. I like big watches as much as the next guy, but I don't always want a Flava Flav clock on my wrist. I might have done one or two things differently myself, but overall, I liked what I saw. The specs are spot on and the watch is an outstanding value at the Kickstarter early bird prices. Pro: Nice size, nice specs, nice price. Con: Hands like Lana Kane. Sum: A solid tool watch with a modern twist. * Update 7/17/14: It seems Douglas has pulled the plug on the campaign with only one-third of the goal funded. I wish him luck on his next venture, and I will not make any more Kickstarter predictions.